These days, whenever anyone asks me how I’m doing, my answer is “exhausted.” It’s a good exhausted, the kind that comes with long days, late dinners, and working on something from roughly the time you get up until the time you finally sit down on the couch with a DVR’d sitcom for thirty minutes before you go to bed. The owners of the farm took off on Wednesday night, leaving us with the animals, the farm, and (most of) the house (they will be moving their remaining belongings out over the course of the summer). We will be renting the place over the summer and buying it as soon as our current place sells. I officially walked through the house with Jeremiah on Thursday. 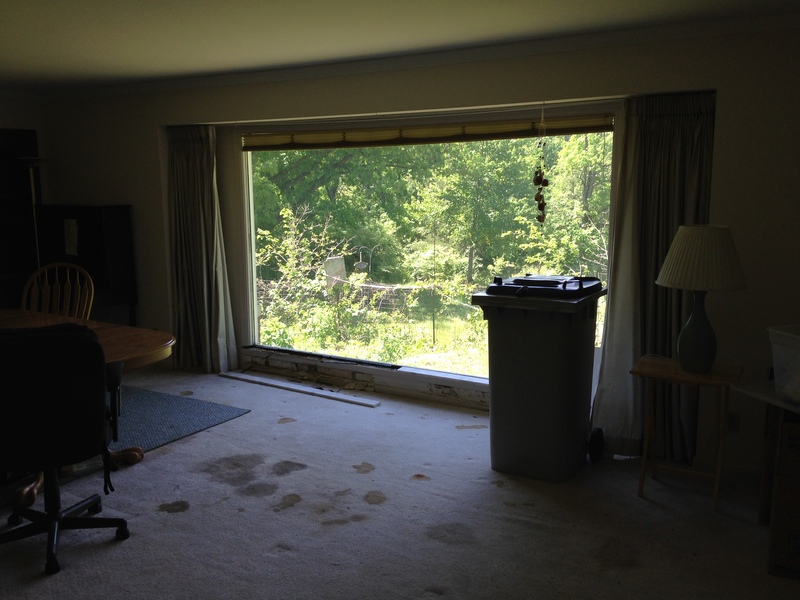 There is plenty of work to be done; a new window in the living room tops the list. The window in the living room that needs to be replaced. It’s been leaking and there’s water damage to the wall below it. There are also several rooms that need new flooring, a bathroom slated for a remodel, and a kitchen that could use updates. Most of that, however, will have to wait until we sell our current house. Equity should pay for some of the items on the list. Until then, we’re working through a list of items that mostly require “sweat equity,” as well as all of those things that need to get done regularly on a ranch. Yesterday was a 12 hour day on the ranch that started with shearing and continued without many stops until we left for the evening. My pet projects are the two rooms inside the barn (tack room and feed room). I have been working on cleaning out the tack room (formerly office/classroom) for three days now, and I’m excited to say that I can see the light at the end of the tunnel. Of course, that light is to be followed immediately by painting …which is about as much fun as cleaning. But, with this project, I can see the end result of a highly functional tack room with a cozy little corner for the barn kitties in my mind already. That makes it easier. And today? Today my guy took off early this morning to take care of the critters so that I could finally take some time to update this thing. He’s probably well into some of his projects already, and I’m still sitting in pajamas. (God Bless that Man.) I will head out there in a bit and get back to it, taking some time first to swing by my parents house and drop off my dogs. (They have been spending a lot of time there lately. I don’t have a fence for them at the new place yet, and I hate to leave them for long stretches in their kennels, so they go to the “grandparents’ house” where they are spoiled rotten.) Then, I’ll be back at it. For now, check out the friend I made yesterday! 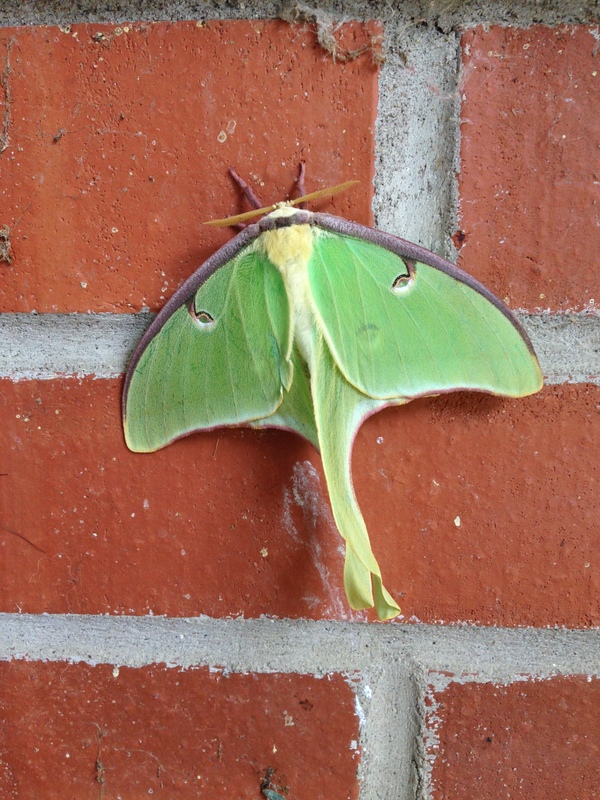 Lunar Moth. He’s my friend. I decided. Excited for both of you as you start anew on this life style adventure!! What would we do without parents/family to step up help out………looking forward to hearing of your progress.